When you’re driven by an uncontrollable urge to challenge yourself, success is measured in the satisfaction you fi nd on the other end. Clinton Wallace wasn’t planning on taking on such a fantastic project, but when opportunity knocks sometimes you have no other choice. November was Clinton’s chance to open that door. 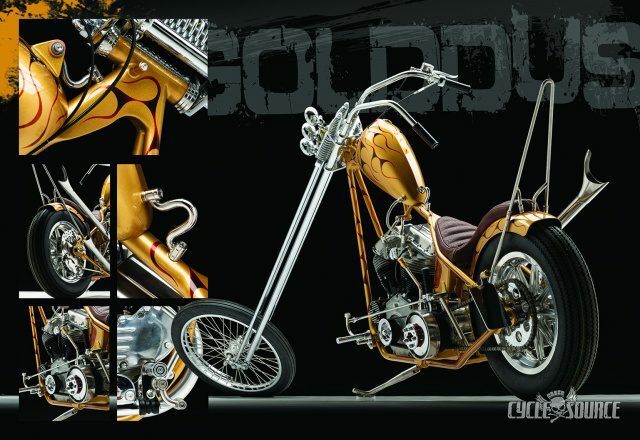 While at the Lone Star Rally in Galveston, Texas he was approached by photographer Michael Lichter and was asked to build a bike for Lichter’s Motorcycle as Art show at the Buffalo Chip during the Sturgis Rally. 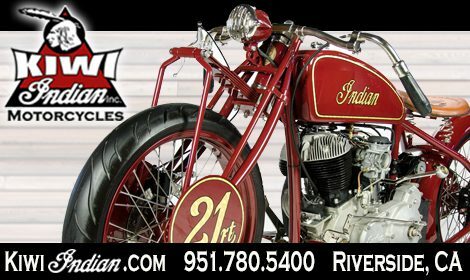 This year’s show was titled “Passion Built”, catering to those that don’t earn their way by building motorcycles but have nine to fi ve jobs and an outside drive to create twowheeled works of art. Honored, humbled, and completely caught off guard by this golden commitment, his fi rst thought after accepting Lichter’s invitation was that he would waste no time getting started. His shop is no more than an enclosed carport attached to his house with the essential tools to get the job done. And, canceling all his plans and religiously answering to a strict schedule, he knew if this build was to come down to the wire by no means would it be for lack of trying. Realizing with past builds that a proper front end takes time to build he made a call based on a friend’s recommendation to Mick’s Chop Shop in California to see if they would possibly have any Springers lying around that would be the catalyst for his build. There was no time to waste, and the front end would need to be a la carte if the timeline was to stay true. As luck would have it, Mick had recently torn down a build for paint and chrome leaving only the front end available. Realizing the time crunch that Clinton was in they were willing to ship him the Springer and make a new one for their own build. The only catch being Clinton had never imagined building a bike with a forty over front end. The next couple of days were spent weighing options and deciding if this was the direction he wanted to take the build. He had always planned on building a long bike,but this was way past anything he had built before. Lucky for him Bobbi, his wife, gave him the push he needed to move forward and a deal was struck. Every dimension of the front end was given to Clinton by Mick, and all his faith then rested in geometry in order to keep moving. Only two weeks after talking to Michael Lichter and agreeing to start this build, the cutting began. With a donor frame he already had on hand, he borrowed a frame jig from a close friend and began the process of stretching and welding. Only eighteen inches longer than his last bikes front end, Clinton fi gured he had a pretty decent grasp on what forty over actually looked like. But when he unpacked that massive box that arrived from California he stood next to a chrome giant towering two feet above his head and realized…this bike was going to be a game changer. A friend donated the 1952 Panhead motor on a handshake with the understanding that they would settle up after the build. It was a basic shell containing all the wrong parts, but it allowed the build to move forward. Clinton rebuilt the trains installing a shorter main shaft to make it all work and the build moved on. Fully aware of the little time that can come at the back end of a build every piece was made using stainless steel. Clinton only builds his bikes to ride. He feels chrome takes away from that experience if there’s always a concern with upkeep and care and stainless fi t the mold. But more importantly, if money or time started to tighten up during the fi nal stages of the build he could always just polish everything and not be forced to wait for everything to get back from chrome. In response, very few chrome pieces adorn this bike. 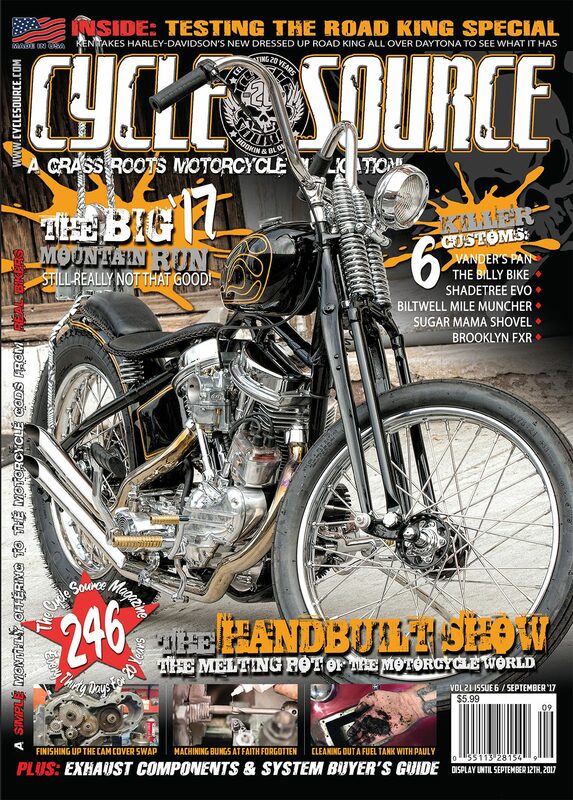 Wallace has a great respect for the old school chopper builds and caters to that look. But he isn’t a slave to the period. He feels that there is no reason to skimp on modern upgrades, an example being the SpeedKing dual caliper setup he used. He believes if they had existed back when choppers were in their infancy, then they would have used them too. A bike is not only meant to look good it’s supposed to be ridden. When it comes to paint, some things are better left to the experts. Scott at Chemical Candy Customs is the only expert Clinton will use. With no ideas blanketed in high expectations, everything was left to the artist. Scott came back with the idea of a luxurious metallic Pagan gold with some old Murano gold and Paint Huffer gold mixed together for a base. The fl ames were then ghosted in with the candy over top. Clinton had never thought of gold as a color, but in the end, there was no other option. While the paint was being created, Clinton Wallace and the 52 Pan made their way to Spicewood Texas for a rebuild. He met up with Bacon at DC Choppers on Friday spending all of Saturday making what was old new again. They went through every piece of the motor, top to bottom, making it a diehard runner and when Sunday rolled around the engine was wrapped up and heading home. As each piece of Gold Dust Woman was completed, it was brought into the house behind lock and key waiting for assembly. Armed with numerous pointers from a conversation with Bill Dodge every piece of meat was meticulously polished. For two weeks, two or more hours a day after work and all weekend the dirty polishing persisted with Clinton learning and adapting along the way. To save time, the rear wheel was outsourced to be stripped and polished over a twenty-four-hour period. The bike was then assembled in the house in its own room. An essential aspect to every build is the headlights. Often treated as an afterthought it can easily make or break the total design. There was no other choice than to go with a tight fi tted triple headlight assembly to complement the lengthy overpowering front end. Fearing a shaky illuminated path, Clinton took his time designing the cradle to perch the three Speed Demon Custom headlights. In the end, there was no time crunch. 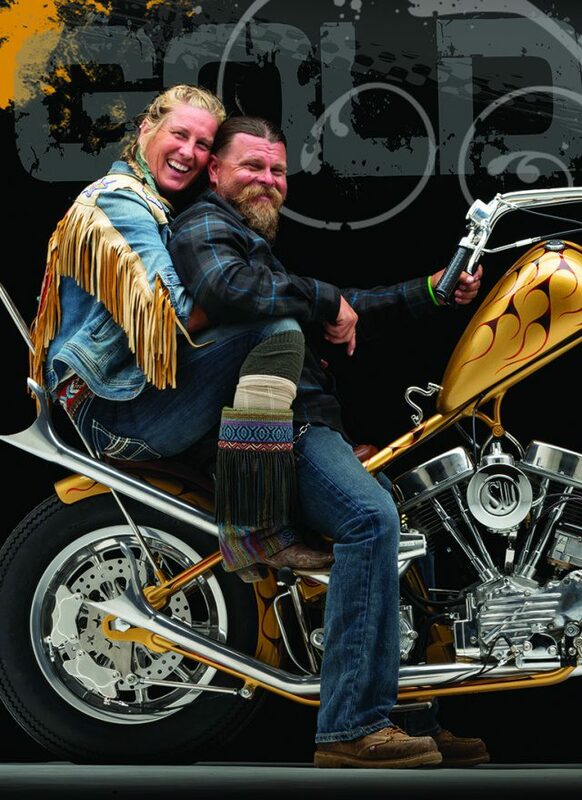 The support he had from his wife and the dedication of those he turned to allowed this epic motorcycle to come to completion in just over seven months. A bike like this would put anyone on the map and the response to the build has been both overwhelming and humbling. A bike like this is a solid foundation for any builder’s career but Clinton only really builds for himself and separated church and state by maintaining a job apart from motorcycles. The open Texas roads were designed for this bike. It runs true and handles like a dream, the way a bike should. You can look for his bike at various shows next season, but for now you’ll fi nd it under Clinton’s smile racking up miles with Bobbi on the back. 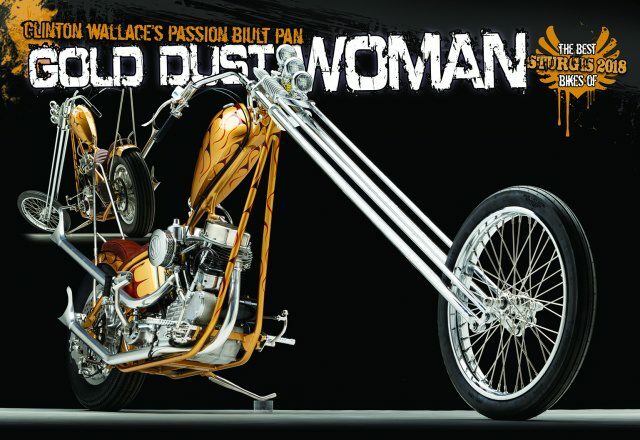 This entry was posted in Feature Bikes and tagged Back Issue, Chopper, custom bikes, Cycle Source, Cycle Source Magazine, Feature bike, Gold Dust Woman, Harley-Davidson, November 2018, Panhead. Bookmark the permalink.